“OK Jake, what’s your last strike?” Manford Rainwater, the local Tucumcari attorney asked. My grandfather responded to Manford, “By simply stating my qualifications.” and then he added, “I will tell the committees and the public, if, in their opinion you or Robert Rowley, turn out to be the better qualified candidate to be judge, then that’s who they should vote for.” That was part of a conversation my grandfather had in 1954 with Manford Rainwater during the election process for the vacant district judge position in eastern New Mexico. Today, New Mexico has thirteen different judicial districts. Prior to 1950, there were nine judicial districts. Under the New Mexico constitution, the legislature may change the complex of the judicial districts every ten years. In 1950, the legislature created the tenth Judicial District composing of De Baca, Harding and Quay counties. David S. Bonem had been appointed by Governor Edwin L. Mechem in June 1951 for the new 10th Judicial District. In 1954, an election for district judges had came around and Bonem, the incumbent and Robert Rowley, were candidates in the primary. Bonem was nominated by his party, but his health was failing. Bonem died in June 1954. Since it was after the primary, it became necessary for Democratic Party to nominate another person to serve as judge nominee. 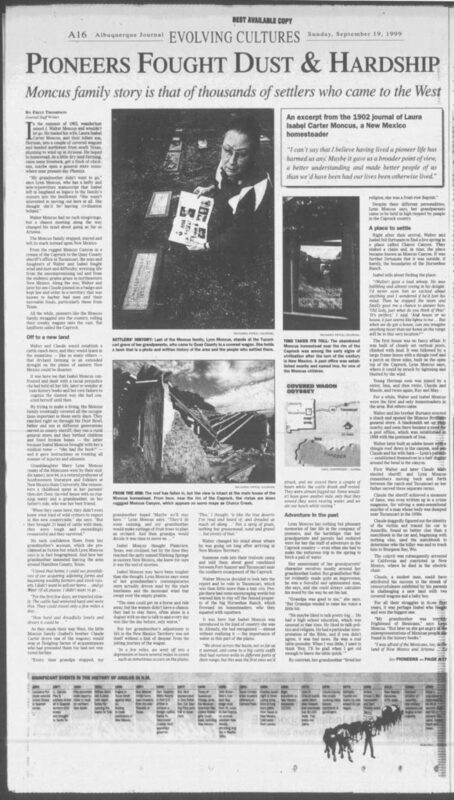 According news articles I found, my grandfather, J.V. Gallegos was the early one in the scramble to seek that nomination. His eager approach would be a hurdle for him later with the New Mexico Governor at the time, Edwin Mechem. Also seeking the nomination was Robert Rowley and Manford Rainwater (Image: Las Vegas Daily Optic, July 30, 1954). The Attorney General ruled that the central committee of the three counties would nominate the district judge. It became necessary to campaign with the members of the central committee of the three counties. This meant working with fifteen people. Manford Rainwater became very active and obtained a number of signatures from the three counties to boost his candidacy. Manford, being a man of emotional character, tried and did arouse a great deal of emotions in many people, particularly in Quay county. It’s very difficult to determine the qualifications of an attorney except what the public opinion and the other attorneys may feel. At that time, Martindale Hubbell rated me as the only attorney in the county with an “A”. That was my campaign. I could use the publication as an aid to my credentials, work experience and my dedication to the profession. A point for Rainwater was that five members of the central committee of De Baca county were Masons like himself. At least four of those five Rainwater was hoping to secure support from. They had been sheriffs of the community back when I was an assistant district attorney. We had became friends when we worked together to enforce the law and back then, there was never any mention of religion. When the committee of fifteen (note article states fourteen members, but then mentions there was a total of fifteen votes) met in Tucumcari to make their nomination, Rowley received one vote, Rainwater received five votes and I received nine votes, incidentally, those nine committee members were from De Baca County. 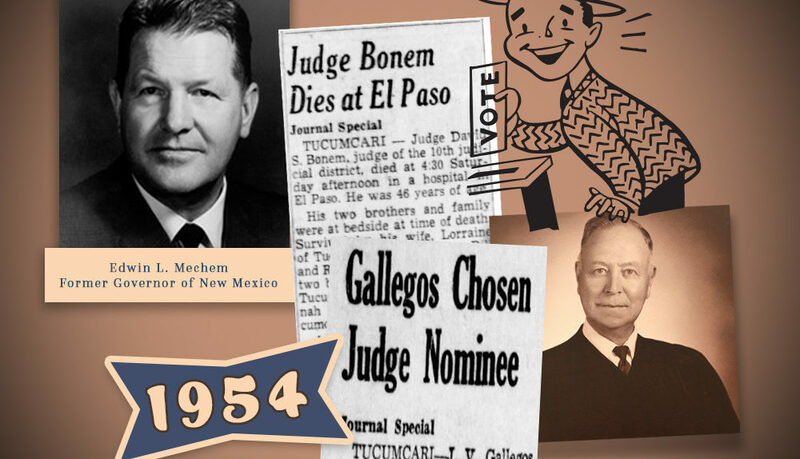 (Image: Gallegos Chosen Judge Nominee, Albuquerque Journal July 3, 1954). Rainwater had been in the legislature and had some influence. He convinced the Attorney General to change his opinion as to how and what committees should nominate the district judge in the Tenth Judicial District. In his changed opinion, the Attorney General wrote Tom Brown, the Democratic State Chairman, that the central committees of the entire state would be the group to nominate the district judge or the state executive committee, com­posed of some 30-50 members. Each community having at least one member in the executive committee . Mr. Brown had met with me, was friendly and showed me the second opinion and asked, ”What shall I do now?” We decided that the Attorney General’s opinion should be followed unless we went to court and overturned it. I campaigned throughout the state, in every county in New Mexico. My wife, Mary, accompanied me most of the time. August of 1954. John Simms was running for governor and was there. He happened to be a good friend of mine. The executive committee voted unanimously for me and nominated me for judge. By now Rowley had dropped out but Rainwater was till in the race, obtaining petitions and campaigning hard. A few days before the meeting in Taos, Claude Moncus, Sheriff of Quay County (soon to be leaving office) was offered the appointment of juvenile officer in Quay County by Robert Rowley if he was nominated district judge. The meeting in Taos was a few days later. Rainwater and his supporters made their pitch. My supporters were there for me. Mrs. Gene Roberts from San Jon made a strong speech in my behalf. At that time I was nominated in Taos by the Democratic State Executive Committee. Edwin Mecham, a republican, was the Governor of New Mexico at that time. There was no opponent on the Republican ticket and I was elected without oppos­ition in November 1954. It was November, after the election and we still had no district judge in Tucumcari. I couldn’t take office until January because I had been elected to take office January 1, 1955, at the end of Judge Bonem’s term. I went to see the Lieutenant Governor, Tibo J. Chavez. I had already spoken with Governor Mechem. He did not make any promises to appoint me to fill out the unexpired term. The Lieutenant Governor could act as governor and do all his duties in the absence of the governor from the state. I filed my oath in Santa Fe as it is required by law. A state officer, such as a district judge, must file his oath of office in writing and swear to uphold the constitution and laws of New Mexico and of the United States of America. My grandfather went through various hurdles it seems to becoming judge, but in the long run, it seems to have really served him well in developing respect as well as political and professional ties all around the state. He really loved his job and Tucumcari. We all should hope to have that much passion for whatever we do in life. I like to do a little background on those in my grandfather’s stories, if I can find it. It sometimes helps me understand the situations a little better, the community at the time and sometimes provides a bit a “closing” to the story as well. Well-known local attorney Robert Rowley passed away in 1987. He was a senior member of the Rowley, Bowen, and Purcell law firm. He had been city attorney for Tucumcari from 1946-1950 and then again, from 1954-1978. Incidentally, he, like my grandfather, was also a member of the local Catholic church. Claude Moncus, born in 1906 in Tucumcari, passed way in 1982. Claude came from a pioneering homesteading family who arrived in Quay county in 1902 in a covered wagon. I found a fascinating news article about the family history of these local pioneers published in 1999 in the Albuquerque Journal (Image: Pioneers Fought Dust and Hardship) Claude’s daughter, Lynn Moncus, was a well-known local I remember growing up. She was long-time columnist for the Quay County Sun, as well as an author, teacher and historian. Lynn mentions her grandmother’s memoirs and how her grandmother wrote, in coming to New Mexico from Texas, her previous perceptions had been changed. “My preconceived ideas of the Spanish race were wrong. I found them to be as upright, honorable and sensible as my own race.” Lynn Moncus died in 2014. As a kid growing up in Tucumcari and years after he had been judge, I can remember my grandfather and Manford Rainwater had developed a friendship. Maybe it was just from working in the same small town together all their lives. As kid, I always thought Rainwater was a funny old character of a lawyer and would see them chat often at the courthouse or in grandpa’s office. They had been through a lot together, more than I had ever realized until I read grandpa’s memoirs. Manford was born in Tucumcari in 1913 and died there in 1997, just a few years after my grandfather passed away in 1992. 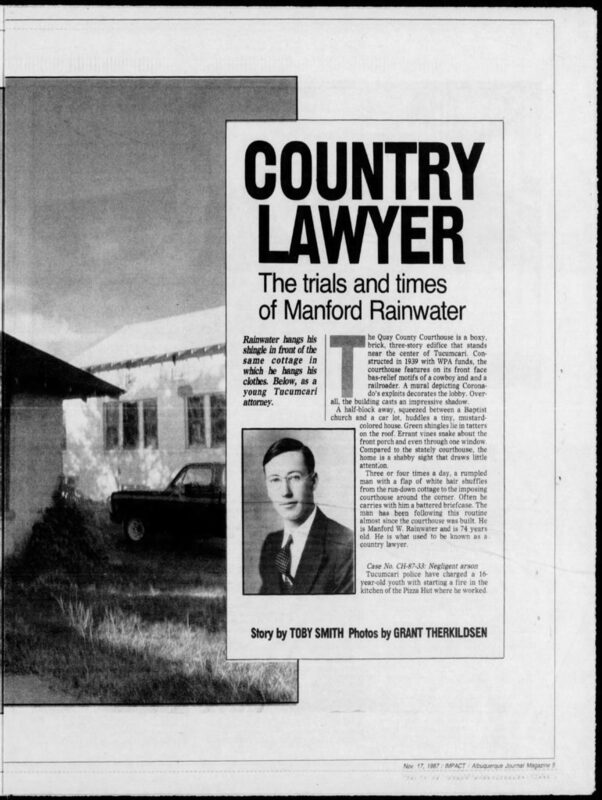 I found this great article from 1987 in the Albuquerque Journal about Manford, and it brought back some memories that made me smile (Image: Country Lawyer: The trials and times of Manford Rainwater).